Kennington Road is a long straight road, approximately a mile in length, in the London Borough of Lambeth in London, running south from Westminster Bridge Road (at the junction with Baylis Road to the north-east) to Kennington Park Road. The road is designated as the A23. In 1636 the Manor of Kennington was an area of meadows with few buildings. By the publication of John Rocque’s map in 1746, the area had changed little. Within twenty years, however, it had begun to assume its modern pattern. The opening of Westminster Bridge in 1750 brought an increasing volume of through traffic, and gave easy access to London. 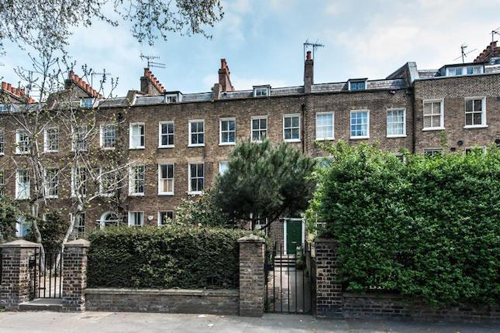 It made Kennington even more accessible and desirable as a place for a country residence. However, the increase of traffic drew attention to the deficiencies of the roads further out. As an attempt to remedy these, an Act was passed in 1750–51 empowering the Turnpike Trustees of Surrey, Sussex and Kent to repair and widen certain existing roads and to make new ones. The latter included Kennington Road, known as the New Road or Walcot Place, linking Westminster Bridge Road with Kennington Common. In 1776 William Clayton, lessee of the demesne lands of Kennington Manor, obtained a private Act enabling him to grant building leases and relatively small parts of the demesne were developed in the decade after 1777. The Cleaver, East and Crooke copyhold estates were also developed at this time, and when Hodskinson and Middleton produced their survey, in 1785, Opal Street (then Pleasant Row), Cottington Street (Mansion House Row) and Kennings Way (White Hart Row) had been laid out, and part of Stannary Street (Kennington Place) ran north-eastwards from Kennington Road; along each of these roads were groups of houses. Almost continuous terraces stretched along Kennington Lane and Kennington Park Road. Number 285 is part of a block with a central pediment. Nos. 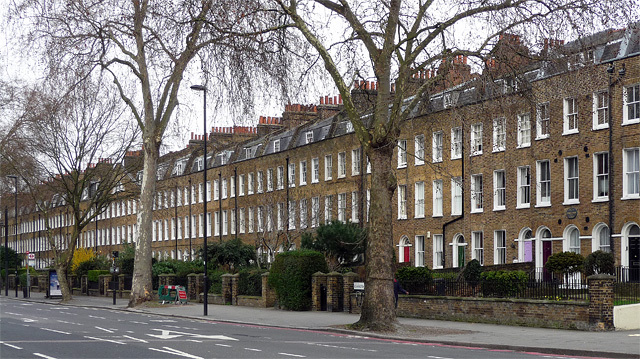 233–291 (formerly 2–31 (consecutive), Chester Place) were erected about 1788–1792 on part of the demesne land of Kennington Manor, called White Hart Field. The field had been known previously as the “eight acres,” and early in the seventeenth century was called the “Coney Warren”. By the time of Richard Horwood’s map of 1799 the modern pattern of this part of Kennington had been set, except for alterations on the East estate some sixty years later. Soon Kennington ceased to be a semi-rural suburb and the value of the property in the area began to decrease as it urbanised. The terrace is listed Grade II and is described as a long late eighteenth century terrace, each house having three storeys, attic and basement, three windows wide. The houses are built of stock brick with a stone-coped parapet and slated mansard with dormers. There are gauged flat brick arches to the sash windows with glazing bars. The centre and end houses have arcaded ground floors with round-headed windows set in stuccoed round arched recesses and impost band. The doors have six panels with cornice head and fanlight (mostly plain) in similar recesses. The three central houses are under a pediment with brick dentil cornice and central window. Some rebuilding was (well) carried out after war damage. Charlie Chaplin spent part of his childhood next door, at 287 Kennington Road (now marked by a plaque), with his father, his father’s mistress and their child. I was asked to advise on appropriate paints and colours. A story of one man’s passion to celebrate the techniques of Georgian house building. Using traditional skills and original materials. This has drawn heavily from Survey of London: Volume 26, Lambeth: Southern Area. Originally published by London County Council, London, 1956. Also The London Encyclopaedia eds. Ben Weinreb and Christopher Hibbert. Macmillan. 1983. 1Charles Chaplin. My Autobiography. Penguin. 2003.